Place your desired weight on to the end of your barbell. Slide clips on after the weight has been added. This ensures that there is minimal movement when you begin to exercise. Place the clips as cost to the center of the barbell as possible. Make sure they are able to move without restriction. Check to make sure they don’t move in a jerky manner or wobble. You want to secure the weight so as not to place yourself in unnecessary risk or harm. Place your knees shoulder width apart. Firmly take hold of the barbell in both hands. Your knees should be slightly bent and flexible. Making the knees hard and locked can increase the chance and risk of injury. Pay close attention to your body mechanics. Make your movements smooth and deliberate. Slow and correct body position will help you correctly increase strength and stamina. Balance your body weight on your toes. Extend your feet behind you in a manner that supports. Straighten the arms but make sure the elbows are not locked. Incorrect positioning can lead to injury as well. Be cautious in your body mechanics at this stage. Roll the barbell in front of you so that your body is very close to the floor. Keep your head straight and looking forward. Make sure your body is in a straight line. The body alignment is crucial in this string of exercise. Correct body alignment is what is the main contributor of gaining core strength and abs definition. Pull the barbell towards the body. 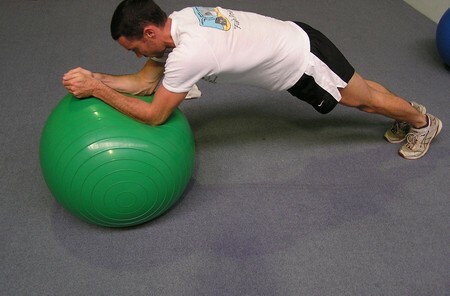 Return back to the push up position. Breathe. Take pre caution not to bend your arms or arch the back. The added strain can misalign your spine and cause trauma. Keeping your body straight is increasing the strength in your core. Move slowly and deliberately. Concentrate on keeping your body in a straight line. This is the benefit and challenge of this exercise. Repeat. There is no limit to the number of times you can repeat this exercise. When you first begin these exercises you may notice that it is quite challenging and you may not be able to do a large number of repetitions. As your body increases in strength and your stamina increase your level of comfort will also. This will allow you to increase the number of repetitions. The most important aspect of these exercises is to do them correctly. There is more benefit in doing fewer repetitions correctly than doing a large number of repetitions in correctly.